Learn about the proven ways to help improve mental health and ease arthritis symptoms if you or someone you know has arthritis and is feeling down or worried. One in 5 US adults with arthritis has symptoms of anxiety or depression. People with arthritis are more likely to have symptoms of anxiety and depression than people without arthritis. It’s important for people who have arthritis to take care of their mental health. Arthritis, anxiety, and depression can all have a negative impact on quality of life. If you have arthritis and are experiencing these symptoms, talk to your health care provider. He or she can refer you to mental health professionals and helpful services. Some of these services may even address your mental health and arthritis together. Over 54 million U.S. adults have arthritis. A recent CDC analysis looked at the prevalence of anxiety and depression symptoms among adults with arthritis compared with those without arthritis. In the U.S. about 10 million adults with arthritis reported either anxiety or depression symptoms more often than those without arthritis. One in five adults with arthritis has anxiety symptoms, and depression symptoms occur twice as often in adults with arthritis as in adults without. Symptoms were more common among adults aged 18 to 44 than among other adults with arthritis. 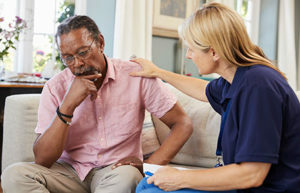 Ask your arthritis patients about depression and anxiety. The U.S. Preventive Services Task Force recommends depression screening for all adults. The Substance Abuse and Mental Health Services Administration encourages universal screening for both anxiety and depression. Offer care and links to services. When treating mental health conditions in your arthritis patients, encourage care that addresses both physical and mental health. Self-management education and physical activity programs are proven to improve mood, energy, and arthritis symptoms as well. Research has shown that all these can help reduce anxiety and depression symptoms. Self-Management Education: Learn More. Feel Better.